Wonder what to wear when your outfit is a bit more casual and relaxed, but you still want something hanging from your neck? Well, wonder no more. What you want is a nice knit tie, preferably plain or with polka dots, but in some cases a striped one goes as well. My own favorite for many occasions. The interesting and eye catching texture is perfect for odd jacket/chino combinations, more casual suits and some will argue this, but in my opinion with jeans as well. 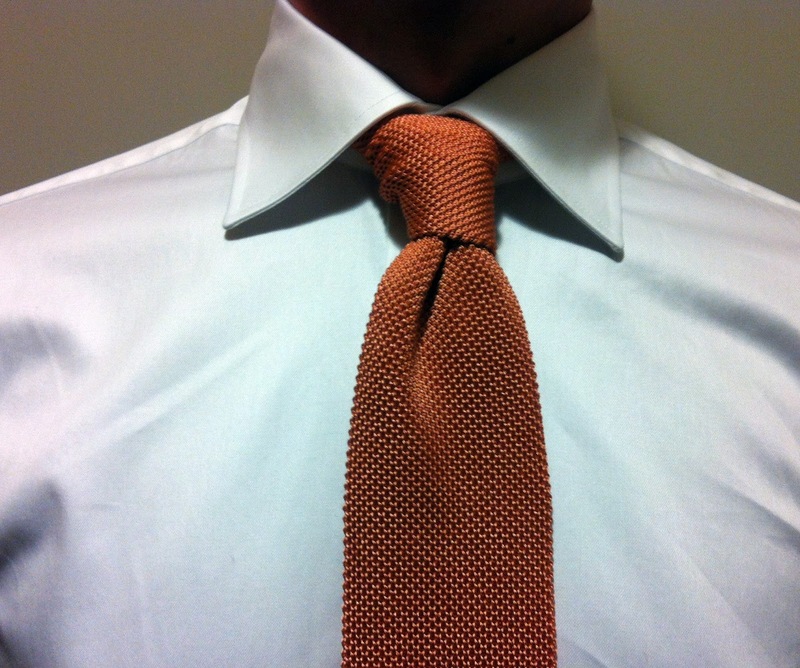 The square end and the tie's structure is also a bit too informal for more formal suits. With them you want to go with a grenadine tie for a more impressive and powerful look. 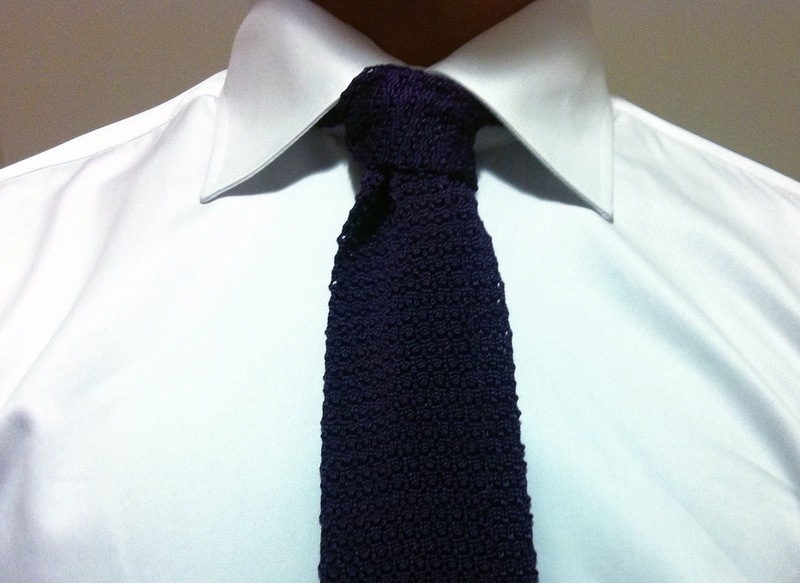 Knit ties are often quite slim at around 2.0-2.25 inches, but I personally prefer the ones that are between 2.5-2.75 inches. They just tie a more beautiful knot and don't look like stuff from an Armani Exchange (or any cheap fashion brand) catalogue. I personally own just plain ones, the easiest and most versatile of knit ties, with the exception of a bi color knit tie. This one has been knit with two different colors to create a tie that subtly changes color depending on where the viewer is. Pin dots and polka dots work well, but these tend to be a bit hard to find. Stripes are a more challenging subject. Some think they never work, I think they work sometimes, depending on the overall total and the even more the tie itself. If the stripes hold a strong contrast, then it rarely works. If, however, the colors are close to each other, it can work well. 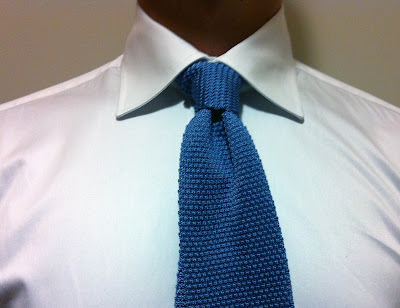 The reason for this is that as the stripes are perpendicular to the tie, they can create a bit obtrusive knot where the stripes are totally vertical. As for the material, it can be both silk or wool. 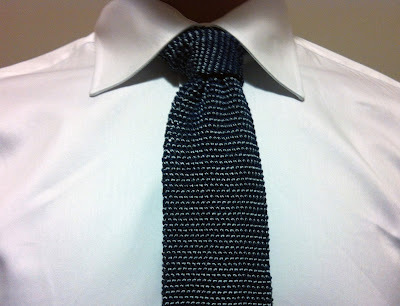 I prefer silk, but a woolen knit tie is perfect for those casual fall days. Also, a cashmere knit tie is just so soft all you want to do is touch it all day long. Overall, I recommend everyone to have at least one or two, preferable one for the summer and one for the fall. It's also the perfect tie for the classroom that also brings some nice Ivy League vibes and makes you the coolest guy in class without a doubt. For work I would suggest it as the casual Friday tie in more serious offices, and a good all-arounder in more relaxed ones. They are also relatively cheap even as new, so there shouldn't be any reason not to have many.